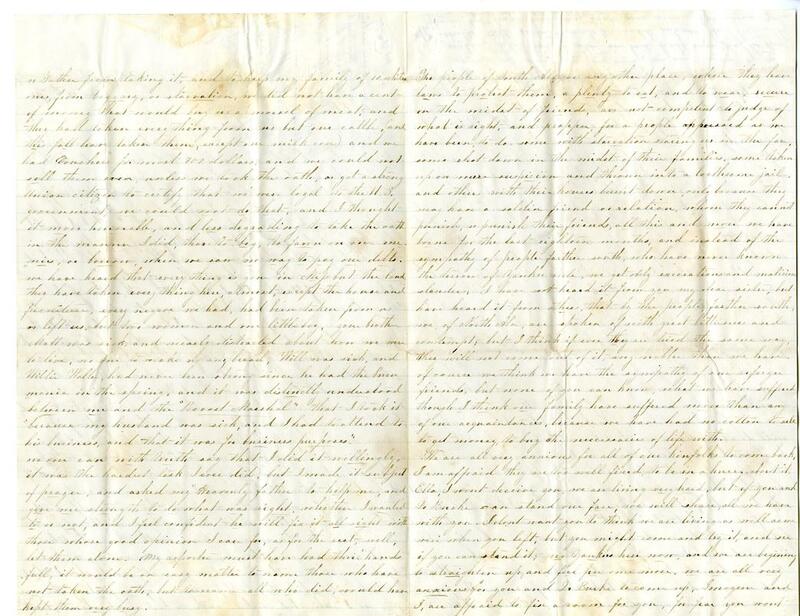 Item Description: This letter, written by Octavia Otey to her sister Ella, describes the hardships they faced on their Mississippi plantation, Green Lawn, throughout the year of 1864. Octavia defends her signing an Oath to the United States saying that she had no choice in order to feed her family while they were “behind enemy lines.” She describes how the Union took everything they had, and that they lost all of their slaves. She worries for her family’s health and ability to find food. Item Citation: From Folder #17, in the Wyche and Otey Family Papers #1608, Southern Historical Collection, The Wilson Library, University of North Carolina at Chapel Hill. 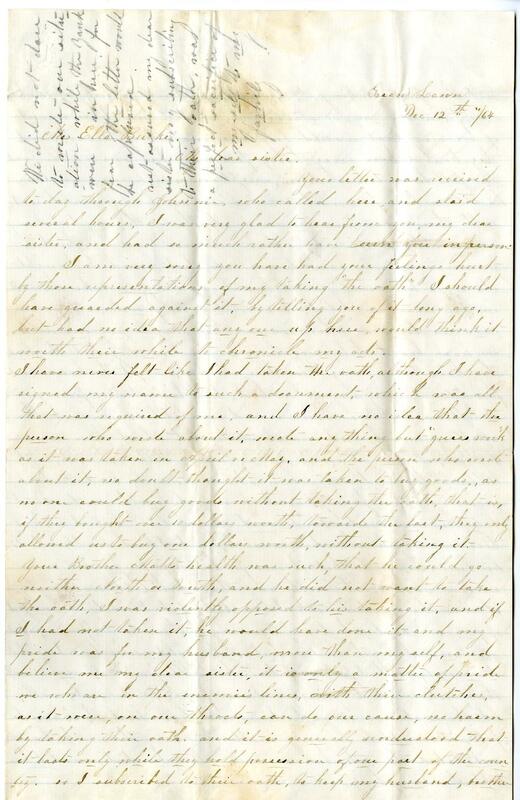 Your letter was received today through Johnnie who called here and staid several hours, I was very glad to her from you, my dear sister, and had so much rather have seen you in person. I am very sorry you have had your feelings hurt by those representations of my taking “the oath” I should have guarded against it, by telling you of it long ago, but had no idea that any one up here would think it worth their while to chronicle my acts. no one can with truth say that I did it willingly, it was the hardest task I ever did, but I made it subject of prayer, and asked my “Heavenly father” to help me, and give me strength to do what was right, whether I wanted to or not, and I feel confident he will fix it all right with those whose good opinion I care for, as for the rest, well, I let them alone. My reporter must hae had their “hands full,” it would be an easy matter to name those who have not taken the oath, but to name all who did, would have kept them very busy. The people of South Ala., as any other place, when they have laws to protect them, a plenty to eat, and to wear, secure in the midst of friends, are not competent to judge of what is right, and propper, for a people oppressed as we have been, to do some with starvation staring us in the face, some shot down in the midst of their families, some taken up on mere suspicion and thrown into a loathsome jail, and others with their houses burnt down, only because they may a soldier friend or relation, whom they cannot punish, so punish their friends, all this and more we have borne for the last eighteen months, and instead of the sympathy of people farther south, who have never known the terrors of Yankee rule, we get only eviscerations and malicious slanders; I have not heard it from you my dear sister, but have heard it from others, that by the people, farther south, we of North Ala. are spoken of with greater bitterness and contempt; but I think if ever they are tried the same way, they will not come out of it, any nobler than we have. Of course we think our family have suffered more than any of our acquaintances, because we have had no cotton to sell to get money, to buy the necessaries of life with. We are all very anxious for all of our kinfolks to come back, I am afraid they are too well fixed to be in a hurry about it. Ella, I won’t deceive you, we are living very hard, but if you and Dr. Burke can stand our fare, we will share, all we have with you. I don’t want you to think we are living as well as we were when you left, but you might come and try it, and see if you can stand it; no Yankees here now, and we are beginning to straighten up, and feel free once more, we are all very anxious fo ryou and D. Burke to come up, Imogen and I, are affraid to fix a room for you, for fear you won’t come. Mr. Otey has been a little better since the Yankees have left, he has brought his rifle to light and has killed squirrels and duck already; there is plenty of game all around. Father too, has his traps, he has caught several rabbits and partridges; Will had the jaundice this fall, and they left him in a weak state of health, which caused him to have chills, I think thought they will soon leave him & I received a letter from dear sister Frances by Johnnie which I must answer; my dear sister you must not grieve too deeply for dear little Occie, you never heard the dear little “angel,” being for something to eat, or have to eat dry biscuits for her supper, whenever I hear Lucy begging for milk or butter, I would think of dear little Occie, whose wants are all supplied. Our poor children have all run wild, they are perfectly uncivilized, and I have no heart to manage them, or do anything, I strove so long to we cheerful and pleasant, when i felt like my heart was breaking, that my spirits have given way, and I do believe if the Yankees had said here a month longer it would have most killed me. Give a good deal of love to sister Caroline and family, for me, tell them I am very anxious for them to come back, but I do not know what they will do about living in that house, I should think it could be cleaned out entirely, I am in hopes you will meet this letter, if you do, and sister Caroline has heard the same thing about me, that you have, you can use your own judgement about sending it on to her, by Johnnie; I hope I have satisfied you, but it is hard to explain anything satisfactorily by letter. Mr. Otey sends his love to you, Dr. Burke, sister Caroline and sister Frances families. Will, Imogene also. Give my love to Dr. Burke also, I hope to see you all soon and may God bless and take care of you, is the prayer of your affectionate sister, Octavia A. Otey. Come up soon as you can, we are non of us well, will has to stay in bed holy every day to keep off chills, Tell sister Frances I would answer her letter by Johnnie, but Have been very sick even since I received you letter. Just able to write you. We did not dare to write our situation while the Yanks were in here, for fear the letter would be captured. Rest assured my dear sister my subscribing to their oath was a perfect sacrifice of myself to my family. 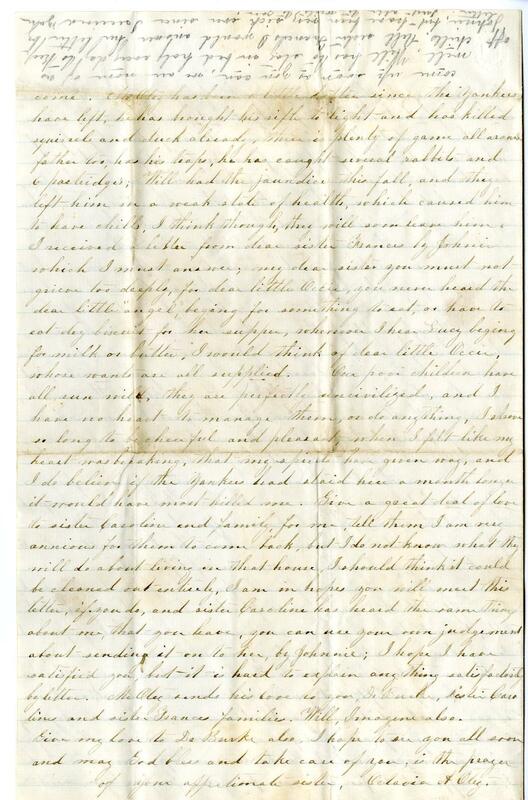 This entry was posted in Southern Historical Collection and tagged Green Lawn, hardships, Oath, Octavia Otey, plantations, Wyche and Otey Family Papers, Yankee Rule. Bookmark the permalink.